Ask any roboticist of a certain age, whether a professional or hobbyist, how they first got interested in robots. 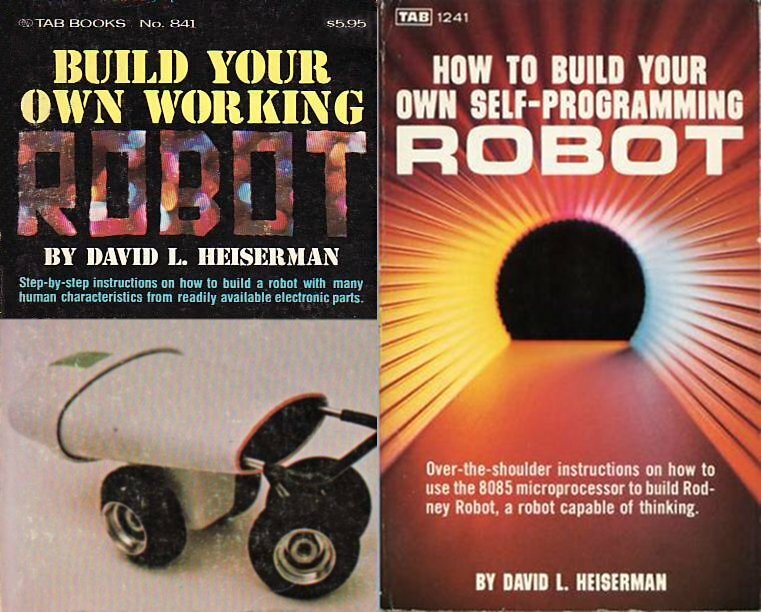 Odds are good they’ll mention a 1976 TAB book, written by David L. Heiserman, called Build Your Own Working Robot. The book described the construction of Buster, a small, wheeled robot. This was before the era of ubiquitous microprocessors. Buster’s brain was a mass of TTL logic chips that implemented surprisingly complex behaviours. In some ways, Buster was not unlike Grey Walter’s vacuum tube-based turtle robots from the late 1940s and was likely the first significant step forward in behavior-based robots since Walter’s turtles. Did you ever wonder what Dave did after writing those books or what he’s up to today? Read on to find out! Two years after Build Your Own Working Robot was published, Dave Heiserman returned with another robot book that brought behaviour-based robots into the computer age. The new book, called How to Build Your Own Self-Programming Robot, described the construction of Rodney. Starting with no knowledge, Rodney explored and learned about his world through trial-and-error, using what he learned to anticipate future explorations. All of this behaviour-based robotics stuff was considered a bit kooky by mainstream researchers in the 1970s, who favored top-down strong AI. Why bother building little insect-level robots that puttered around on the floor? Machines needed to understand deep philosophical questions first. They needed to represent the entire world symbolically and reason about it like human brains. Only then would we be ready to put them on wheels or legs. So even though hobbyists almost immediately set to work building Buster clones, Heiserman was largely ignored elsewhere. But mainstream AI was already running into dead ends, entering what’s now known as the AI Winter. And those Buster-building hobbyists were entering Universities and beginning to set the stage for a change in the direction of AI research. Before long, Rodney Brooks arrived on scene and coined the name ‘subsumption architecture’ to describe his own bottom-up, behaviour-based robots. Robotics and AI research were revitalized. While you aren’t likely to see a mention of Heiserman in any official history of AI or robotics, it hard to imagine that his books didn’t play a part in those changes. Even today I find that most hobby roboticists still remember him. Many still have the two books shown above or one of his many other books. I was reminded of this recently when, during a visit the Dallas Personal Robotics Group, I ran across several copies of Build Your Own Working Robot in the group’s library. I picked one up, opened it, and realized it was the very copy that I had bought in 1976 and later donated to the DPRG. It got me thinking about all of this and I wondered whether Dave might still be around. I set out to find him and, along the way, I collected questions from other robot builders; questions they’d always wanted to ask the author whose books inspired their interest in robotics. I did find Dave and he graciously agreed to an interview. Below you’ll find his answers to your questions. Robots.Net (RN): How did you become interested in robots? Was the Buster robot your first attempt at building a robot or had you built previous ones? And, if so, what were they like? David L. Heiserman (DLH): I grew up fascinated by robot stories, especially those from sci-fi movies of the 50s–“The Day the Earth Stood Still” and “Forbidden Planet,” for example. I built a radio-controlled “robot” in the early 70s. The thing I remember most about that machine was the convulsions it always suffered during a thunder storm. Also, I really enjoyed showing people how they can do things that were commonly thought to be only for big research labs and budgets. So I also did a book on amateur radio astronomy and home-made video games. RN: How did your first robot book deal with TAB come about? There weren’t a lot of non-fiction robot books or hobby robot clubs at that time. What got you interested in writing a book about robotics and how’d TAB get involved? DLH: Before I hooked up with TAB Books, I was already building a reputation for writing technical and computer care-and-feeding PC books for Prentice-Hall. I don’t recall the details, but I probably approached TAB with the idea for robot books (naturally P-H had no interest in such manuscripts). There was one other do-it-yourself robot book circulating at the time my first ones appeared. RN: How to Build Your Own Working Robot credits the students of Ohio Institute of Technology in Columbus for helping with Buster. Can you tell us a little about how the project was done and how the students were involved in helping? Did the school have a robotics or mechatronics program at that time? DLH: The school simply agreed to provide the hardware and allow a couple of my BE students to get special lab credit for building Buster according to my specs. The school got its due credit when the project “went viral” for a few weeks with radio interviews, TV spots and a feature article in Rolling Stone. This was a 2-year technical college, and the closest thing to industrial robotics were courses in Industrial Electronics. RN: How did you pick the names Buster and Rodney? I’ve heard people ask if Rodney was named for Rodney Brooks but your Rodney preceded Brooks’ work by some years didn’t it? DLH: As you probably know, when you work on a machine for a while, it begins taking on a personality. Those names simply popped into my head while tinkering with them. Yes, I think Rodney Brooks was graduating from college about the time my first robot-intelligence books appeared. He has done far more than I would ever care to do with intelligent machines. RN: Do any of the Buster or Rodney robots still exist? What became of them? Do you currently have a robot of any kind around the house? DLH: Rodney is gone, but Buster has been resting peacefully in my basement for a few decades. There are no other robots. I’m not even close to being a contemporary robot enthusiast. RN: What’s the story behind the cover photo on Build Your Own Working Robot? Was that merely a mock up someone made for the book cover or was that a real robot? DLH: It is an embarrassing mock up created by the graphics department at TAB. I was unaware of it until the first copies appeared in my mail. RN: Most people in the hobby robot community, even today, have heard of you and your robot books. But I’m not aware of you having any direct interactions with the modern hobby robot community. Once the books were completed did you continue to have an interest in robotics? Do robot hobbyists correspond with you very often? Do you speak at local hobby robot events? DLH: I have no direct interaction with the hobby robot community today. I do get a bit discouraged at all the publicity for annual robot competitions around the world, using machines that are no more sophisticated than a Radio Shack toy. On the other hand, I’ve seen some marvellous little “cognitive” machines on YouTube. I have no particular interest in anything but the purely philosophical aspects of robotics today. I hear from a hobby robot person every 4-5 years. RN: Are you aware of many readers who successfully built the robot designs in your books and perhaps improved on them? DLH: Yes. I occasionally do online searches for people referencing my robot books. That’s how I keep up with the improvements people have made to my initial ideas. RN: The designs presented in your books were arguably the most advanced in terms of behavior-based robots since Grey Walter’s turtles from the late 1940s, and until Rodney Brooks’ subsumption based robots of the late 1980s. Did you ever publish in any research journals or garner any interest from University roboticists about your designs? DLH: I often feel like the Rodney Dangerfield (“Rodney?”} of robotics in that “I get no respect” — at least not from the academic world. The respect I do get comes from the people I always intended to encourage, enlighten, and entertain in the first place — you guys. RN: Prior to Brooks, the AI community seemed more interested in complex top-down approaches that started with human-level intelligence tasks. You took an evolutionary approach that started with simple behaviours and worked toward more advanced ones. Were you aware you were bucking the trend at the time and did you ever discuss the two approaches with other roboticists or researchers? I’m curious if your approach was well-received at the time or considered too strange for mainstream researchers of 1970s? DLH: I was fully aware that I was bucking the trend, and there were a few in the AI community of that time who really believed they were obligated to “straighten me out.” But I took comfort in knowing I was having a whole lot more fun with little machines actually functioning with 16k of RAM than they with their plans that required the then-impossible amount of memory for mapping every possible environment. Sometimes it is simply the last man standing that wins the game. RN: Did you ever consider taking any of your robot designs commercial as kits or assembled robots? RN: Do you have any future plans regarding robots – more books, more research, anything like that? DLH: No. As I mentioned earlier, I have some philosophical interest … but that’s all. RN: What have you been up to since your last robot book? Are you currently working on any interesting projects (robot-related or not) that you’d like to tell us about? DLH: My current brainchild will be 15 years old in August, 2012. Check it out at www.free-ed.net. Free education. and career-building for the digital age. Yes, I’m catching a lot of the same flack I got years ago with the evolutionary machine intelligence thing. But I’m hanging onto this project, and the times are catching up with me. It’s a rush.